Townhill Studio’s Annabel Wilson will create special colours and shibori designs to match your interior decor, curtain pattern or wallpaper and to the size and shape perfect for your room. Initially make contact with Annabel and the majority can be done by email, text and post. The complete shade or lamp will either be delivered by courier or if in the South West perhaps in person! 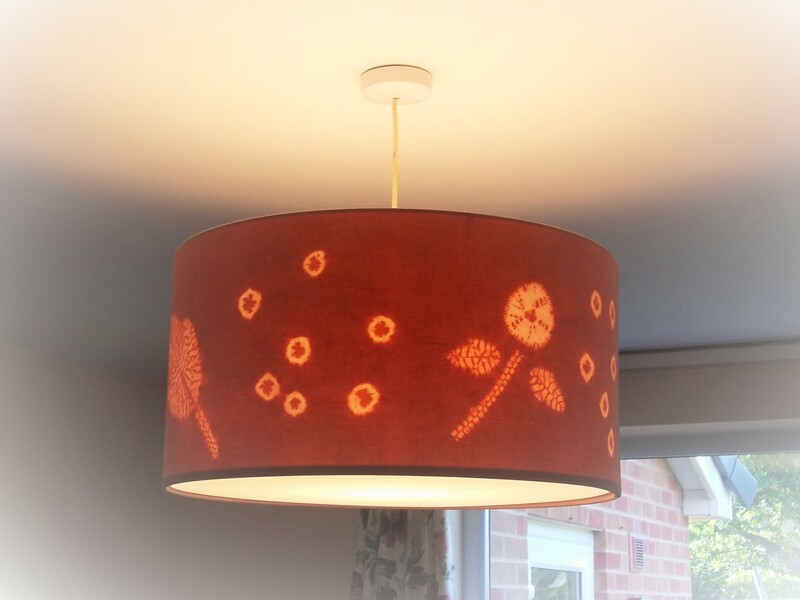 As a guide costs per lamp or lampshade will vary from £200 to £600 dependent on size and shape and how detailed the design is. From a piece of your fabric I will translate some of the motifs into a shibori design and create a colour sample for your approval that complements your existing fabrics and interior decor. I will need a sample of fabric or paint to match colours, a photo of the room and likewise I need to send you design proposals and actual colour samples for you to make a final selection. A 25% deposit is required before making up. Here is an example of a commission and how the design was achieved. Taking the client’s new curtain fabric by Laura Ashley I select some design elements to use in the design of a 24cms deep x 18″ diameter lampshade. These are a leaf and small bud design seen on the fabric and then translate them into shibori stitch work. I make a drawing of the proposed shade and chose to dye it the soft pink shade colour matching the original fabric, madder root dye is perfect to create that colour. I make a presentation to the client at this stage with drawings and colour samples to obtain approval. Then I commence the creating of the shade.